Have you noticed dark streaks on your asphalt shingle roof? If so, you aren’t alone. Many houses across much of middle and eastern America and the western coastline develop these stains. However, this discoloration can appear almost anywhere. The dark stains may come from a number of sources. This includes dirt, mold, mildew, and imperfections in the shingles themselves. However, these streaks are most commonly caused by Gloeocapsa Magma, an algae that feeds off of the limestone in the asphalt tiles. This algae is spread by airborne spores. Are these dark streaks harmful or just an eyesore? The algal stains caused by Gloeocapsa Magma are, in and of themselves, not harmful. However, the consistently humid conditions that allow the algae to thrive may eventually become a problem. What if your asphalt roofing tiles are improperly installed or very old and overdue for replacement? Moisture may creep into the gaps and cracks around them, potentially damage your roofs structure, and even create a breeding ground for mold in your house itself. Even if the staining doesn’t hint at a deeper problem, the roof's appearance may affect how well homeowners enjoy their property. A streaked roof creates an eyesore that clashes with otherwise neat and well-kept home exteriors and landscaping. It could also put off buyers when the property is put up for sale by implying the owner isn’t passionate about maintaining their home. The first line of defense against these dark stains is prevention. 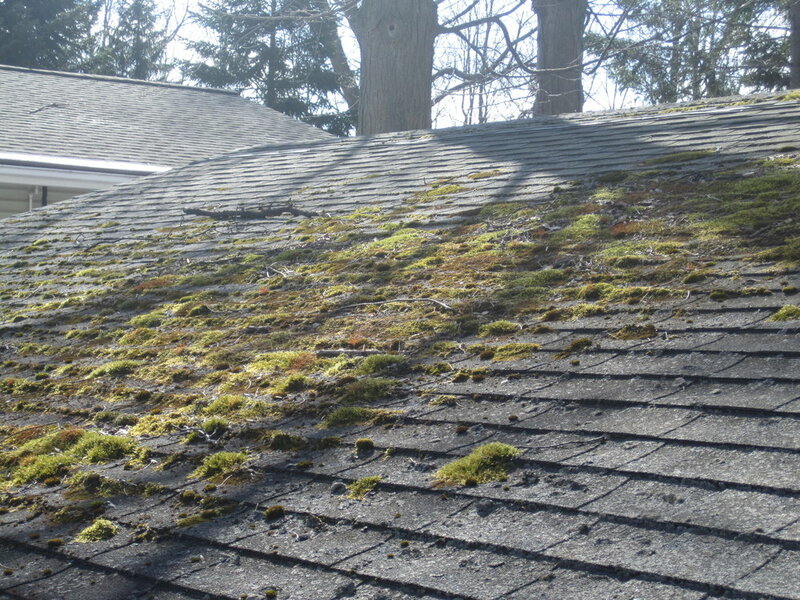 Homeowners can invest in algae-resistant roofing shingles. These may appear to be regular tiles but have small amounts of copper mixed in to the coating. Copper is naturally toxic to Gloeocapsa Magma and will deter the algal growths that cause dark streaks. It’s also important to have the roof properly installed by an experienced professional such as Greenawalt Roofing Company to ensure the longevity of your shingles and create a good seal against moisture. If you already have stains on your roof, there are a number of products on the market that can remove them. For mild staining, a simple oxygen bleach solution can do the trick. This is also relatively gentle on the asphalt shingles and not very harmful to the environment. For severe staining, you may need harsher chemicals or pressure washing. These are effective on extensive or dramatically dark stains, but may decrease the life of your roofing shingles. Is this a good project for a handyman or DIY homeowner? Probably not. The treatments that are least likely to damage the roof are also least likely to have any effect. It may be best to call a professional who will get the job done right the first time around.